Control speaker resonance to increase frequency range and enhance sound. Control the volume and width of the sound coming from your own virtual center-stage for performance-grade audio effects. A concert in your house. No Sub? No problem. Let Hear use your existing speakers to boost your bass. Don't you need more thump in your life? Fine tune reverb to emulate any venue from phone booth to concert hall. Either way, it's music to your ears. Music the way it was meant to be heard. 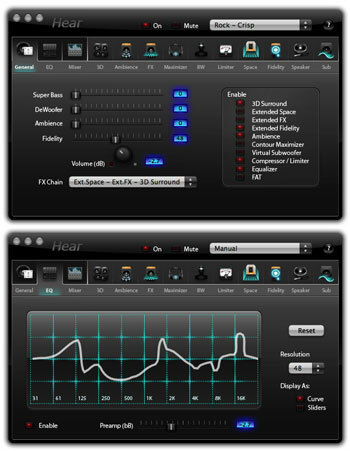 Restore frequency, coloring and intensity lost during the recording process. Put more "hi" in your "fi". Qweas is providing links to Hear for Mac 1.0.5 as a courtesy, and makes no representations regarding Hear for Mac or any other applications or any information related thereto. Any questions, complaints or claims regarding this application Hear for Mac 1.0.5 must be directed to the appropriate software vendor. You may click the publisher link of Hear for Mac on the top of this page to get more details about the vendor.